It was Sunday, and we decided to sleep in a bit and catch up on our rest. I was pretty sure I’d heard thunder during the night, and when we woke, it was raining. Oh well, can’t let that get us down. 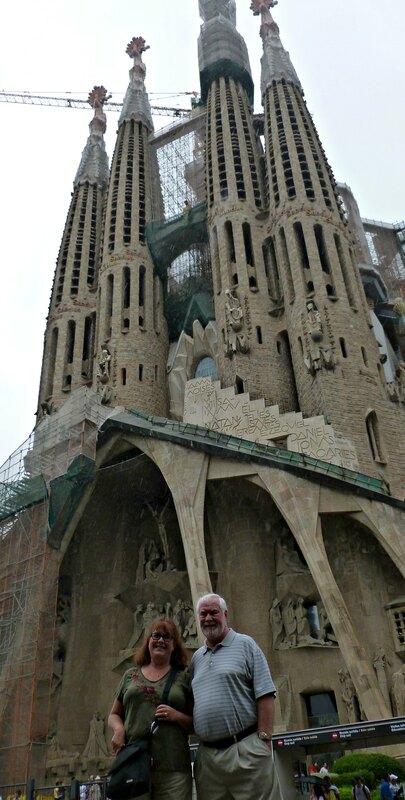 After a snack at the hotel, the three of us decided we’d see what we could do to get to the inside of Sagrada Familia. We knew there were “ways” to get a ticket – as our guide Christian had informed us the day before. We just had to go to a certain bank machine – a special one that sold event tickets – and voila! We would have our tickets without having to wait in line. We hopped in a taxi, went to the Basilica and returned to the special ATM that we were shown the day before. Wouldn’t you know it, the darn thing was not working (for the ticket part, anyway). We then considered waiting in the regular line to get the tickets, but it was raining and the line up went around the block, literally. SO, we had to be happy with again viewing the outside of this amazing structure. David snapped this photo of us in front of the church. This was taken with one of the newer facades in the background. I really like this side, as it has a timeline of sorts, in sculpture, showing the last days of Christ. Here’s a photo of two things of interest. First you’ll see the two men embracing. This depicts Judas kissing and betraying Jesus. 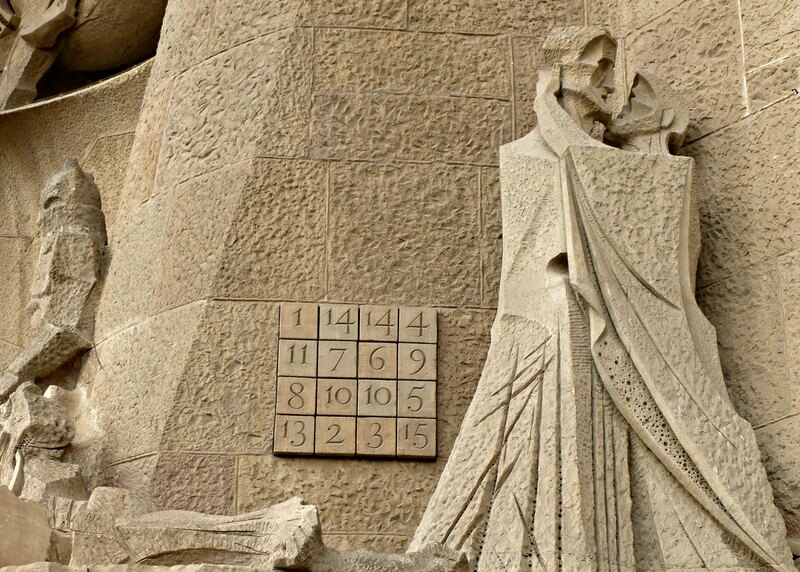 Next to that is the “Sudoku-like” set of numbers. If you add the numbers up in any column, any direction, even diagonal or zigzag, it always adds up to the number 33. The age of Jesus when he was crucified. John was very impressed and made sure I got a close up of it. Well, the rain continued to fall and we were a bit disappointed that we couldn’t get tickets to go inside. We grabbed another taxi and returned to the hotel. David needed to be at the airport by mid afternoon for his return flight to London. We just hung out in the hotel lobby and visited until it was time for him to catch a ride to the airport. It’s never fun to say goodbye, but this time it wasn’t quite as painful. We knew we’d be seeing David again soon, sometime around Christmas. After he left, the rain stopped and John asked me what I’d like to do. 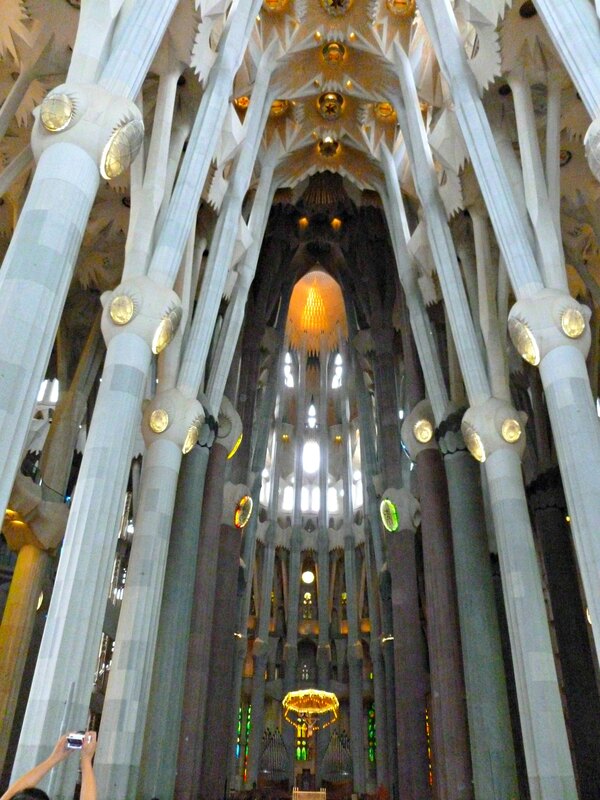 I replied that all I really wanted to do was to somehow get inside Sagrada Familia!! He too knew that it was today or never…. so, we decided to attempt to buy tickets online. The hotel manager was ever so helpful, and before long we were printing those tickets! Back in the taxi for a return trip the the Basilica! Since we already had tickets, we were able to bypass the (still) very long line. The inside was sure worth the trouble of printing out the tickets and making a return trip!! 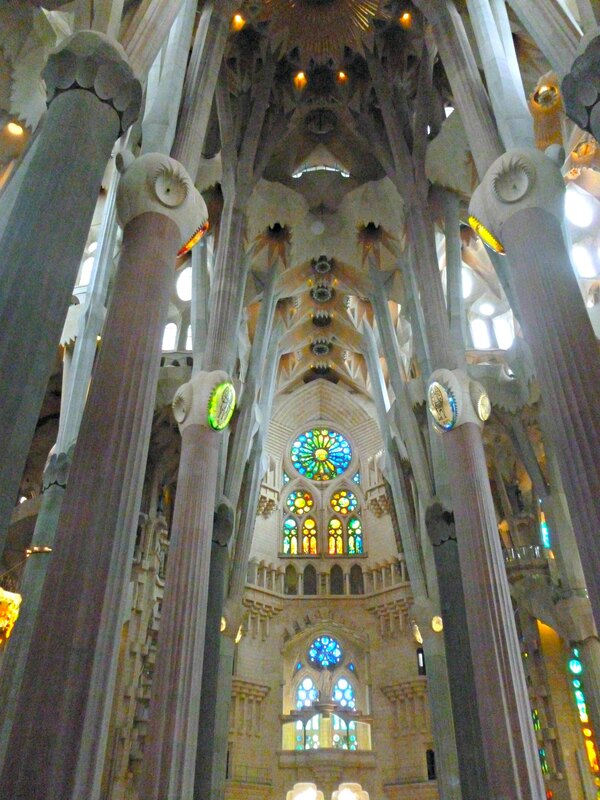 Apparently, Gaudi had a huge love of nature and the columns inside were made to look like stalks of a plant. SO unique and interesting!! I loved how the light poured in through the window near the ceiling. All I can say is that this place was amazing. It really grabbed us both with it’s unusual beauty and design. If you look near the bottom of this next photo, in the center, you’ll see a round object, all lit up. 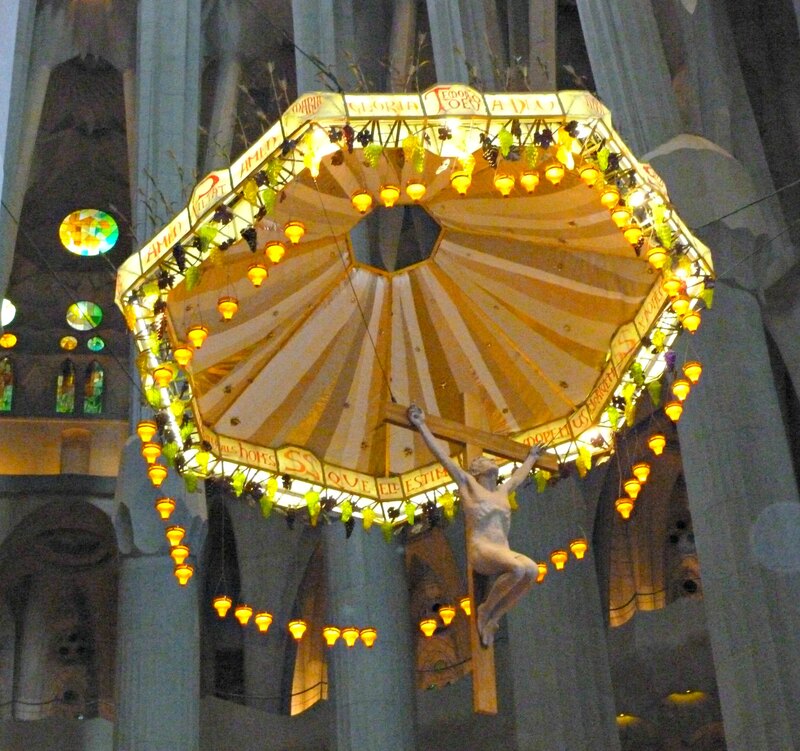 Believe it or not, this is Jesus, hanging over the altar. The following photo will be a close up of just that. 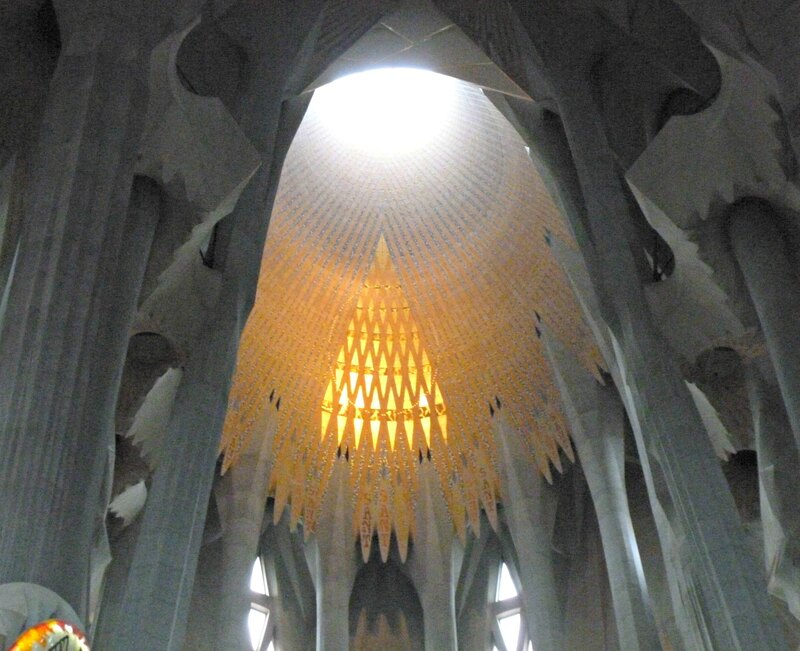 After our wonderful visit to Sagrada Familia, we returned to the hotel, with plans to meander across the street that evening to “Patagoinia” for dinner. They didn’t even open till 8pm! Like I said, Europeans like to consume their evening meal quite late! We enjoyed a leisurely steak dinner, knowing the next day we’d be boarding the long awaited cruise ship. 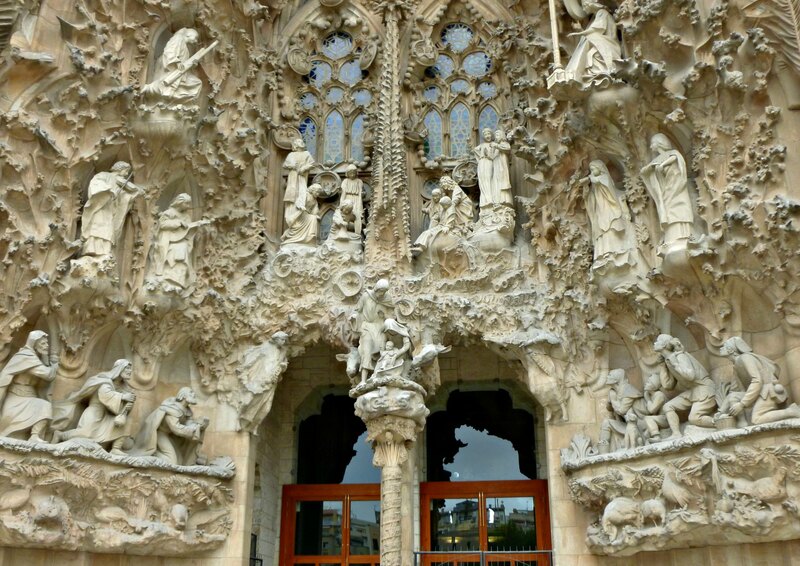 This entry was posted in Travel and tagged Barcelona, Basilica, Mediterranean Cruise, Sagrada Familia. Bookmark the permalink. So glad you got to view the inside and wow you weren’t disappointed…..simply amazing!